Budget cuts are slowly undermining the effectiveness of fire services in England and Wales, the head of the Fire Brigades Union (FBU) has said. 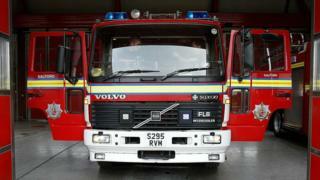 Fire services' budgets in England have been cut by 17% since 2010, according to National Audit Office figures. And a BBC Radio 5live investigation has found response times in some areas have got worse in 2016, which the FBU's Matt Wrack says is putting lives at risk. Fire minister Brandon Lewis said fire services had sufficient resources. According to 5live Investigates, austerity cuts since 2010 have resulted in 3,382 fewer fire fighters, station closures and some appliances being taken off the road. Until last year the government published average times for brigades to get a first response vehicle to a house fire - the type of incident that claims most lives. Figures suggested four out of five brigades had seen worsening average response times between 2009/10 and 2014/15. The government has not updated those figures. However, 5live Investigates made a Freedom of Information request to all 48 fire brigades in England and Wales for the figures for 2015 and the first six months of 2016. Out of the total number of brigades 27 responded, with the data suggesting 17 had seen a further deterioration in response times to house fires. In Cambridgeshire, the average response time in 2015 was 9.24 minutes. In the first half of 2016, it had increased to 12 minutes. In Suffolk, the average response time for a call-out to a house fire had been 10 minutes. This year, it was 13 minutes. Meanwhile, in Essex, the average response time increased from 6.47 minutes in 2015 to eight minutes. Mr Wrack, general secretary of the FBU, said: "There is very long-standing evidence that the longer it takes to get to incidents, the more likely people are injured or killed. Deborah Gibbons' father Bernard Lewis died after a fire at his house on the Wirral, on Merseyside. The number of fire engines at her local fire station had been reduced from two to one. The first crew were on scene quickly, but they could not begin a rescue until a second crew arrived - and that took longer because it was coming from further afield. Ms Gibbons said: "It seemed to take forever for the second engine to arrive… we had to wait. The fire service couldn't do anything; they couldn't go in until the second engine had arrived." "I'm sure if there had been a second engine here sooner we would have had a different outcome." Merseyside Fire and Rescue Service said it had tried to maintain a swift response time for the first emergency crew to reach a house fire. The brigade's chief fire officer, Dan Stephens, said it "simply isn't possible to minimise the impact on response times for second and subsequent appliances when the overall number of appliances is reduced". He said it was "one of the inevitable consequences of the cuts". "The fact that we are taking longer to get to incidents means there are people being injured or killed who would otherwise not have been." Home Office minister Mr Lewis said he believed there was room for further reductions to fire and rescue service budgets. "Public safety is a government priority and our fire and rescue services do vital, life-saving work day in and day out. "And there has been a long-term downward trend in both fires and fire deaths for many years, recently reaching historically low levels." 5 live Investigates is on BBC Radio 5 live from 11:00 GMT on Sunday, 11 December.